Leadership is confronted with large changes and challenges in the 21st century. Due to digitalization and interconnectivity, value is usually not created locally anymore, but across borders and even continents; complexity thereby naturally increases, minimizing the predictability of future developments. Organizational boundaries are becoming progressively pervasive and working relationships more and more flexible. Innovation is often created outside the firm, enhancing interdependencies. Knowledge grows exponentially, speeding up business and creating immediate pressure to act. Little time remains to develop long term strategies. Leaders are increasingly in the public eye, with numerous stakeholder groups enforcing their claims. All these changes pose sufficient challenges to organizational leaders: The racial diversity of the workforce increases, making cross-cultural leadership skills necessary. Doug Ivestor, former CEO of Coca Cola, puts it like this: “As economic borders come down, cultural barriers go up, presenting new challenges and opportunities in business”. Demographic changes in Western societies lead to talent shortage and increase the need to make use of all available human capital, fueling debates about women’s quotas and diversity initiatives. Especially in inter-organizational ventures or knowledge-intensive working environments, leadership often has to be carried out without formal authority or legitimacy. According to Barbara Kellerman, famous Harvard leadership scholar, “[…] the old leader-centric model, with the leader at the helm controlling the action, no longer holds – it‘s passé, obsolete” (more information on “the end of leadership” here). Leadership is increasingly spread across teams, with the focus shifting from leader to followers, thereby satisfying the demand of generation Y employees for flattened hierarchies. In the same vein, the debate about the best leadership style has started to change, making clear that there is not “the one” right way or style to lead. But how can organizational leaders react to those challenges? Let’s start with the first challenge: Globalization and diversity. Being able to effectively lead multinational companies and a racially diverse group of employees requires the acquirement of cross-cultural leadership skills. As identified by project GLOBE, a large-scale scientific study surveying over 18.000 leaders in 62 countries, cultures differ strongly in their respective values. Whereas in Russia and Thailand, a high power distance (high difference in power between leader and follower) is regarded as normal, it would be seen as highly unusual in Denmark or the Netherlands. If a Danish leader were to try to establish a 360° feedback tool (whereby feedback is gathered from supervisors, peers, but also from followers) in Thailand, he or she might face unexpected resistance, as giving feedback to one’s supervisor might be considered as highly insulting. Preparing leaders to go abroad, to lead nationally diverse teams and to create value chains across different countries therefore constitutes a major task for today’s leadership development. With regard to diversity, yet another topic comes to mind: The debate about women’s underrepresentation in leadership positions and ways to address this inequality. In most Western countries, women still lag behind men regarding leadership positions, a phenomenon for which the term “glass ceiling” has been coined. Recent studies by Prisca Brosi and colleagues even show that women are expected to lack the strategic abilities necessary for managerial positions, but also the required willingness to lead (except for when showing the positive emotion of pride). Because of the second leadership challenge, the acute talent shortage, integrating women as well as other underrepresented groups in (top) management positions will become a necessity for all organizations. This can best be achieved by clearly structured and open ways of recruitment, high levels of employer branding, the creation of more flexible working opportunities and the establishment of diversity goals throughout the company. Going on to the third leadership challenge, the demand for flattened hierarchies, shared leadership – the distribution of leadership within the team instead of or in addition to classical vertical leadership – might be a good solution and response. In knowledge-intensive corporations it is already common to have specialists taking over (informal) leadership roles. As Josef Ackermann, former CEO of Deutsche Bank, states: “Problems have become so complex today that you have to collect the expertise and opinions of a lot of people before you can make a sound decision”. Take the example of W.L. Gore & Associates, manufacturer of, amongst others, the famous GORE-TEX® fabric: W.L. Gore practices a high degree of shared leadership – leaders are not formally assigned, but emerge “naturally” according to their competence and the respect they have thereby gained with others. Goals and decisions are made by the most knowledgeable person in the domain. By providing employees with direct lines of communication and a high degree of intra-organizational exchange, this type of leadership seems to perfectly support W.L. Gore’s innovation process (click here for Wall Street Journal’s interview with CEO Terri Kelly). Sharing leadership contributes to various desired organizational outcomes such as team performance, followers’ job satisfaction or creativity. In contrast to the above-mentioned findings linking leadership ability and motivation more to men than to women, a recent study by Gesche Lotzkat and colleagues has shown that women are regarded as being especially capable in exerting such joint leadership forms. In top management, a trend similar to shared leadership has started to emerge: Collective leadership. In arts, law or higher education, formal authority is increasingly divided between two to three leaders. This formal separation of leadership can be very effective when roles are clearly defined, contain complementary rights and co-leaders support and trust each other. Besides the demand for sharing leadership responsibilities, volatile times also tend to enhance the demand for charismatic leaders, addressing the core of the challenges defined above: The search for the right leadership style. Trying to end this search, researchers have often postulated that leaders should guide their subordinates by providing them with a vision and the motivation to contribute to a higher purpose (e.g., to “make the world a better place”) – a process called transformational leadership. Yet, transformational leadership does not seem to be the “golden” way of leading it was often said to be: The construct is still ill-defined, leaving leaders confused about which specific behaviors to display. Studies proclaiming the advantages of transformational leadership have often confused causes and effects. We therefore postulate that, rather than trying to guide followers via adopting a certain leadership style, leaders should focus on behaviors that influence two of the most crucial determinants of effective leadership: Justice and trust. As demonstrated in a recent study by Lisa Ritzenhöfer and colleagues, trust in leaders rises when leaders show their gratitude; leaders acknowledging others’ contribution to a success are perceived as being more benevolent and integer. Going hand in hand with this finding, research by Tanja Schwarzmüller and colleagues has also shown the potentially negative consequences of anger: When showing anger towards subordinates, leaders seem to rely especially on threats, which might enhance performance in the short turn, but prove detrimental in the long run. In summary, the 21st century poses a range of challenges to organizational leaders. 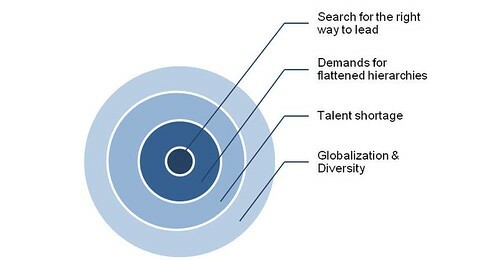 Globalization, talent shortage, demands for flattened hierarchies and the search for the right kind of leadership force leaders to adapt. Cross-cultural leadership training, improvement of selection and assessment processes as well as shared and collective ways of exerting leadership might support leaders in mastering these challenges. On the behavioral side, instead of focusing on leadership styles, leaders should concentrate on building trusting and just relationships with their followers. Showing positive emotions towards followers might be an effective tool to reach this goal. by Dipl.-Psych. Tanja Schwarzmüller, Dipl.-Wi.-Ing. Prisca Brosi, Dipl.-Psych. Gesche Lotzkat, Dipl.-Psych. Lisa Ritzenhöfer and Prof. Dr. Isabell M. Welpe. The research project which forms the basis for this article was funded by the German Federal Ministry of Education and Research and by the European Social Fund of the European Union (FKZ 01FP1072/73, research project “Selection and Assessment of Leaders in Academia and Business”). Barton, C., Grant, A., & Horn, M. (2012). Leading in the 21st century. McKinsey Quaterly, 3, 1-17. Brosi, P., Spörrle, M., Welpe, I. M., & Heilman, M. (2013). 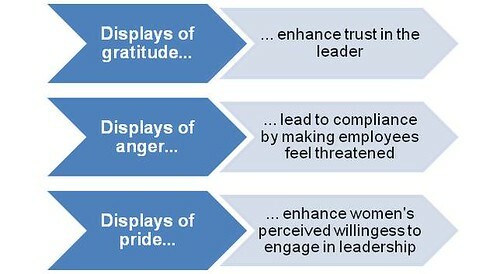 Expressing pride increases perceived willingness to lead: Especially for women. Manuscript in preparation. Brosi, P., Welpe, I. M., Peus, C., Braun, S. & Frey, D. (2012, September). Gender and strategy: Another stereotype? [Gender und Strategie: Ein weiterer Stereotyp?] Presentation at the Congress of the Deutsche Psychologische Gesellschaft (DGPs), Bielefeld, Germany. Javidan, M. H. & House, R. (2001). Lessons from Project GLOBE. Organizational Dynamics, 29(4), 289-305. Lotzkat, G., Braun, S., Welpe, I. M., & Schneider, S. (2012, September). Shared leadership as a chance for women?! Presentation at the Congress of the Deutsche Psychologische Gesellschaft (DGPs), Bielefeld, Germany. Manz, C. C., Shipper, F., & Stewart, G. L. (2009). Shared Influence at WL Gore & Associates. Organizational Dynamics, 38(3), 239-244. Ritzenhöfer, L., Brosi, P., Spörrle, M., & Welpe, P. (2013). Kind or Competent? Differential Influences of Leaders’ Expressed Pride and Gratitude on Followers’ Trust via Trustworthiness. Manuscript submitted for publication. Schwarzmüller, T., Brosi, P., Spörrle, M., & Welpe, I. M. (2013). Costs and benefits of anger: Leader use of negative emotion displays and power perceptions. Manuscript in preparation.